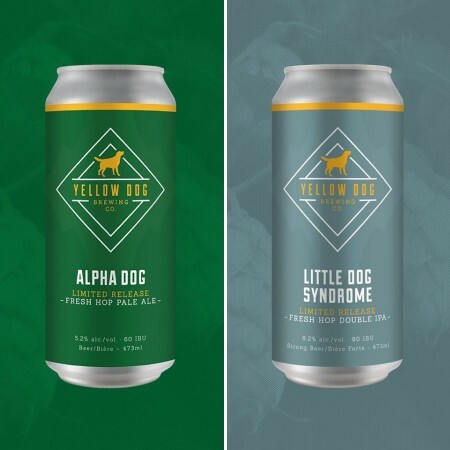 PORT MOODY, BC – Yellow Dog Brewing has announced the release of two beers made with freshly picked hops. Alpha Dog (5.2% abv, 60 IBU) is a pale ale brewed with fresh Citra hops that was released last week. It was joined today by Little Dog Syndrome (8.2% abv, 80 IBU) a double IPA brewed with fresh Mosaic hops. Both beers are available now at Yellow Dog in 4-packs of 473 ml cans, and on tap for glasses and growler fills. Cans of Alpha Dog are also available in local private liquor stores, with Little Dog Syndrome shipping out to stores next week.